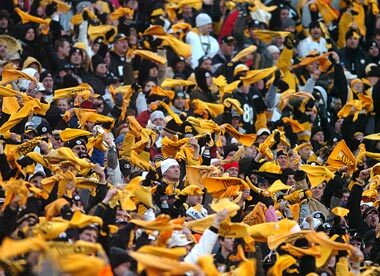 By now, all true Steeler football fans are on about day No. 17 or No. 18 of what I like to call Pittsburgh “crap-aganda.” It happens every time their team plays in the AFC Championship and advances to the Super Bowl. Before you get your babushka or Terrible Towel all up in a twist, know this first. The four-letter word beginning with a ‘c’ and ending in ‘p,’ is sometimes used across town as sort of an endearing word for “stuff” – as in, “I told mum I’m going dahntahn to buy more Steeler ‘crap’ (memorabilia).” Of course, this expression may be a little less exotic than the “you guyses” the “yinzs” and the “yois” the region is famous for, but it is still part of the voice of the ever-deepening Pittsburgh propaganda process. One notion that has been passed along to us descendants is that with the rise of Steeler football came the dispersal of Pittsburgh natives from their ancient front porches set along the hills of Southwestern Pennsylvania. I will contend that in more recent years, the Internet explosion has allowed those who have flown the nest to extend their arms and wrap themselves even tighter around their beloved hometown sports franchises. In the current case, they just love their “Stillerz,” That’s what makes it all larger than life. And they just love to let anyone willing to listen hear about it. I know. I have an inbox full of the stuff already. Born and raised in Washington DC, my main tie to the town has been through my father and grandfather, both die-hard Pittsburgh sports fans (from Natrona) during their days on earth. My native Pittsburgh cousins and their families naturally carry on the tradition more passionately than I do. People I’ve met in the work place, at the golf course, even on the streets and in the (Steeler) bars of “Anywhere USA,” do the same. The dismantling and reinvention of the city has created the spread of what is now known as Steeler “Nation.” While the unprecedented spread of the unique Pittsburgh culture has helped fuel the fire, it’s been the world-wide web that has launched it into another stratosphere. In 1972, I sat behind and watched in horror as my father fell sideways out of – and destroyed – his favorite TV viewing chair when Franco Harris made the “Immaculate Reception.” While Franco ended up in the end zone, my dad landed in the fireplace (fortunately for him, Steeler history at the time prevented us from burning any victory logs for the game). A lot of folks will say that was the day Pittsburgh propaganda was launched – and my dad, a pure Pittsburgher, certainly would have staked part of a claim to it. Where it will end, nobody from the Steel City seems really ready – or willing – to find out. A few of their teams, and of course their social networks, simply won’t allow it. It’s true, Pittsburgh vernacular includes the likes of “perogie,” “city chicken,” “pop,” “still mill” and “kielbasa.” Admittedly, these terms are only remotely familiar to descendants of Western Pennsylvanians. But fire up the computer and I, along with the rest of Steeler Nation, get the privilege of reliving a part of our past every time the boys in black and gold waltz (sorry, polka doesn’t work here) their way to another Super Bowl. I am one of the ever-unfortunate displaced Yinzers. I hailed not from Pittsburgh, but from Central City, 80 miles to the east. But, believe me, it's All-Pittsburgh-All-the-Time in the town of less than 1200. "N'at" has replaced the period at the end of all my grandmother's sentences. City Chicken (i.e., "Breaded Pork on a Stick" for those of you not in the know) was a weekly part of the family menu. I need to ask, though: who here calls it "keel-boss-uh" and who calls it "koll-boss-ee"? My family long ago adopted the latter of the two. I believe one is actually a Polish sausage and the other is, perhaps, German or Austrian? Either way, they are interchangeable in my family these days. Mike, I am born and bred Yinzer and my family has always pronounced it as a combo of both in sorts: we say kah-boss-ee. Every day I wake up, I am proud to be from Pittsburgh and to be a Yinzer and a part of Steeler Nation! I have converted many to the Steelers, expecially in college, and a close friend of mine who is born and raised in Queens was rooting black and gold and NOT green and white in the championship: he says that my devotion to the Steelers was infectious and reminded him of his devotion to the Mets. He waves the towl to this day.